You are here: Home / BLOG / Political Corruption / The Iraq War Was Called “Operation Iraqi Liberation” (OIL)? Everyone knows that the US invaded Iraq in 2003 to combat terrorism, dismantle Saddam Hussein’s stockpile of high-tech doomsday weaponry, and to promote democracy in the Middle East. However, because no “weapons of mass destruction” were ever discovered and no meaningful ties between Iraq and Al Qaeda were ever found, some of the more cynical political commentators started to suggest that Iraq’s abundant oil reserves might have influenced the Bush administration’s decision to invade. 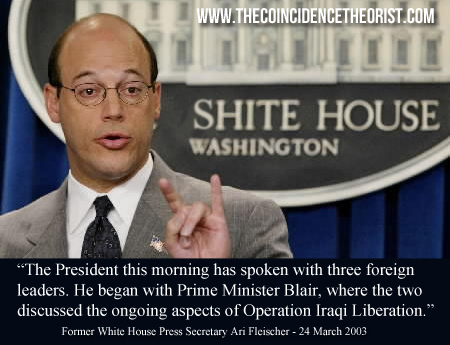 During the opening days of the war, White House Press Secretary Ari Fleischer actually referred to the war as “Operation Iraqi Liberation” which produced the rather unfortunate acronym “OIL”. Admittedly, this probably didn’t look great from a public relations perspective and only served to fuel arguments from critics. Fleischer used the name “Operation Iraqi Liberation” in press conferences on at least two documented occasions (24 March 2003 and 1 April 2003). The title “Operation Iraqi Freedom” was used consistently from then on, presumably after the “OIL” acronym was highlighted to officials. Tony Blair dismissed the Iraq-oil connection as a ‘conspiracy theory’, and it’s not like he would lie about anything! And just because President Bush and Vice President Cheney were formerly oil executives, and National Security Advisor Condoleezza Rice was a former director of Chevron, and Secretary of Commerce Donald Evans was former CEO of Tom Brown inc., it doesn’t mean that anyone from the Bush Administration had any vested interest in the invasion of an oil-rich nation. And it’s not like the US wanted to maintain military or economic dominance by controlling a critical oil and natural gas producing region. 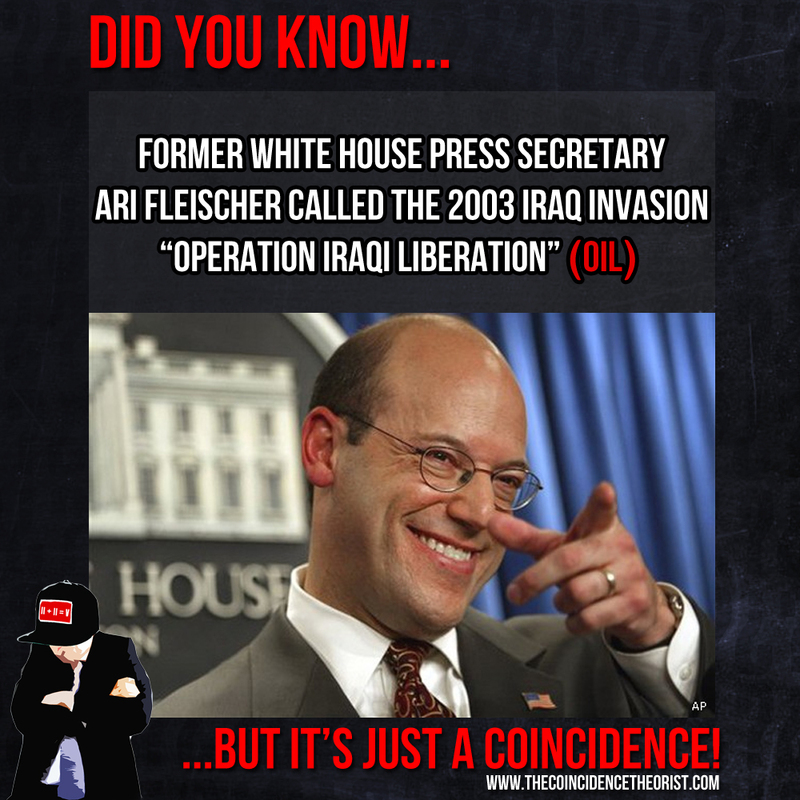 Oh and Fleischer probably just called the war “Operation Iraqi Liberation” by mistake… on two separate occasions… in two separate press briefings.